The Moon Etherium is in a StoryBundle this month, with eleven other fantastic fantasies by fellow SFWA authors! For another $10, you get eight more bonus books! Including mine! Which you probably already have if you want it but HEY there's still eleven excellent books you might not have yet! If you've never bought from StoryBundle before: they're very easy to use. They keep records of your purchases indefinitely, so you can download and re-download whenever you want. And if you use the Kindle app, they'll send books directly to your Kindle reader. You can also gift books to other people through it. And all of their books are DRM-free. Also! Proceeds from sales are split up to three ways. There's a slider that sets the cut between the authors and the StoryBundle site: it defaults to 70% to the authors and 30% to Storybundle, which is the usual author/Amazon split. You can adjust the slider, though! Independently of adjusting how much you pay. So you can give a bigger cut to the authors, or to Storybundle. And you can opt to give 10% of your payment to the charity for this StoryBundle, which is SFWA*! * Yep, SFWA is a charity! SFWA's mission is to support, defend, advocate, educate, and promote the SFF community. New release sale for The Moon Etherium ends today! Last chance to buy it for $2.99! The $2.99 sale on A Rational Arrangement and Further Arrangements also ends today. I'm also gonna beg for reviews now, because having some reviews up is enormously helpful in selling a book. Readers are much more likely to take a chance on an unknown author if there are some reviews on the book, and a lot of promotion opportunities are only available once a book hits a certain number of Amazon reviews. A long time ago, one of my friends suggested to me that the world would be better off if there were only one human gender: if everyone was hermaphroditic, say. "It'd eliminate gender discrimination. What good do gender differences do us?" I never liked that idea, although it was hard to articulate why. I've certainly never been fond of gender roles. But gender itself? I like the diversity of it. It's fun. After writing A Rational Arrangement, where societal and legal pressure to conform to a heterosexual, monogamous ideal was overwhelming and a major source of conflict for the characters, I wanted to write about a much more open society in The Moon Etherium. I made a magic-rich setting where all the characters had easy access to a variety of powers, including shape-shifting. In their society, gender is a choice: a choice one can change on a whim, and doing so is unremarkable. Many characters in The Moon Etherium strongly identify with a particular gender and do not change it. Most identify as male or female. But some identify as neuter, and some identify as a mixture, and some change randomly, and all of this just happens and no one much worries about it. One of the challenges of writing the story was presenting this without giving it undue emphasis, because to the characters it's trivial. 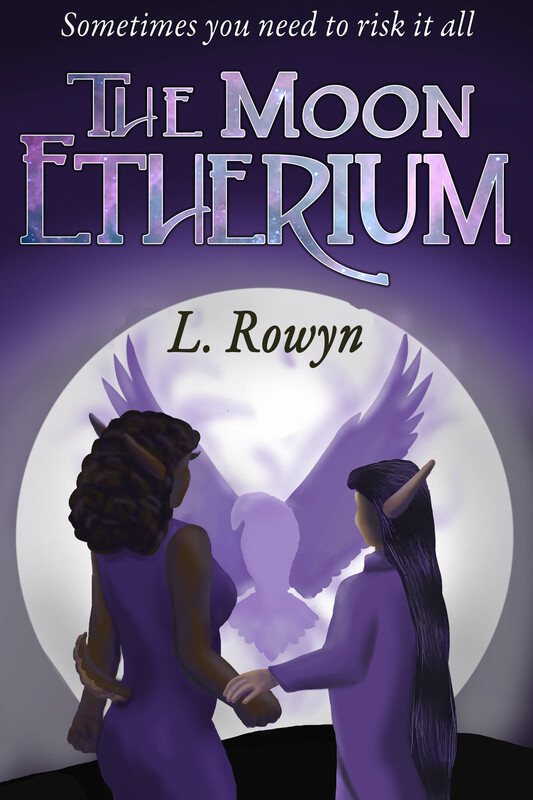 The Moon Etherium's romantic subplot is M/F and between two people, so in a sense the LGBTQIA+ and poly-postive aspects of the setting are not integral to the story. The main protagonists strongly identify as male and female, respectively. There were various reasons why I wanted to write their story this way. Part of that was that my protagonists live in a society without gender roles, and I wanted to distinguish between "gender roles" (which is a meaningless concept to them) and "gender identity" (which they do have, although it's more fluid for some than others). I didn't want to write about a society where characters took on male forms to do masculine activities and female ones to do feminine activities (though that could be interesting!) But I did want one where the people still felt that male/female/etc. had some meaning. Because gender is fun. 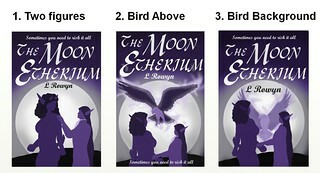 The Moon Etherium: Book Launch! A prince of the Sun Etherium, Mirohirokon has everything: immortality, invulnerability, and the aetheric power to be anything he desires, to satisfy almost any desire. But the one thing aether cannot give him is his father's freedom. For a chance to win that, he will risk everything. Sick of the petty, twisted politics of the Moon Etherium, Ardent quit it for a simpler life. Yet when Miro seeks her aid to rescue his father, she realizes that far more is at stake than one man's life. Duty-bound, she returns. But to save their world, must they sacrifice their love? On sale for just $2.99! Buy it now! Sale ends October 5. My previous books, A Rational Arrangement and Further Arrangements are also discounted to $2.99 in honor of the new release. 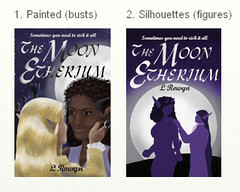 The Moon Etherium is the book I drafted in six weeks back in the spring. It took me a little longer to get it ready for sale, but it's here! It has some of my favorite story elements: magic, romance, and problems that the protagonists have to work together to overcome. I'm very pleased with how it came out and already working on another standalone novel in the same setting. I hope you all will enjoy it, too. Sunday's poll was overwhelmingly in favor of the silhouette-style cover, on both LJ and Twitter. I got some good suggestions on the theme of "make it more fantasy"*, however, so I poked at a couple of new versions. Which means it's time for POLL PART 2. I will probably tweak whichever one I go with. I am doing both best/worst questions because I can easily see a three-way tie for "which do you find most compelling" and still have a clear "this one is least compelling". Lettering is still a placeholder! Final layout will be different. * Special thanks to terrycloth and archangelbeth for suggestions! I set a release date for The Moon Etherium, my magic-rich fantasy romance: September 26! That means it's time to freak out about the cover some more! So I spent like 20 hours working on a painting for the cover several weeks ago. I have become increasingly less happy with it. I tweaked a few things about it that particularly bothered me, and I'm okay with it now. But I'm not sure it's the best possible choice. I fiddled with some alternates a couple of weeks ago, and while my quick Twitter poll favored one of them, I kind of hated it. I decided to do some more variants on the same general theme. I actually did five total, but I'm only showing the one I like best here. And a poll, of course. Because poll. The lettering is a placeholder, so don't worry about that part. alinsa will be doing the actual text layout. I just threw some words on so it would look cover-ish. gnibbles did a cover for me! I am ambivalent about my skillz as an artist, particularly when it comes to realistic illustration. Silhouettes I can handle. Full color ... eh. But I have, once or twice, done full-color portraits that approach the general vicinity of the skill level I want for The Moon Etherium cover. Moreover, the final image is going to be mainly seen at 150x250 or 300x500 or so. So I was thinking, maybe if I start with a really big file and then shrink it down a lot, it could be mistaken for professional? I am unconvinced by this reasoning. Still, I kinda felt like drawing this morning, and I really did not feel like writing, so I took some reference photos of myself, did a sketch, and started to color it. Not in the slapdash fashion of my quick doodles, but a serious attempt to make it look good, no matter how long it takes. I didn't really keep track of time, but this is probably 2-3 hours in. I am abandoning it here. Interestingly, I'm quitting not because I feel like I've proved to myself that I'm not good enough: the jury is still out on that one. From the technical "does this look like a picture of a person?" perspective, it's not that bad. From the "does this look like an appealing character?" perspective, though, it's not working. I think Gnibbles's painting has more heart and spirit. Mine looks ... off. Not just "I need to futz more with it" (which I do), but it just looks fundamentally not-very-attractive. 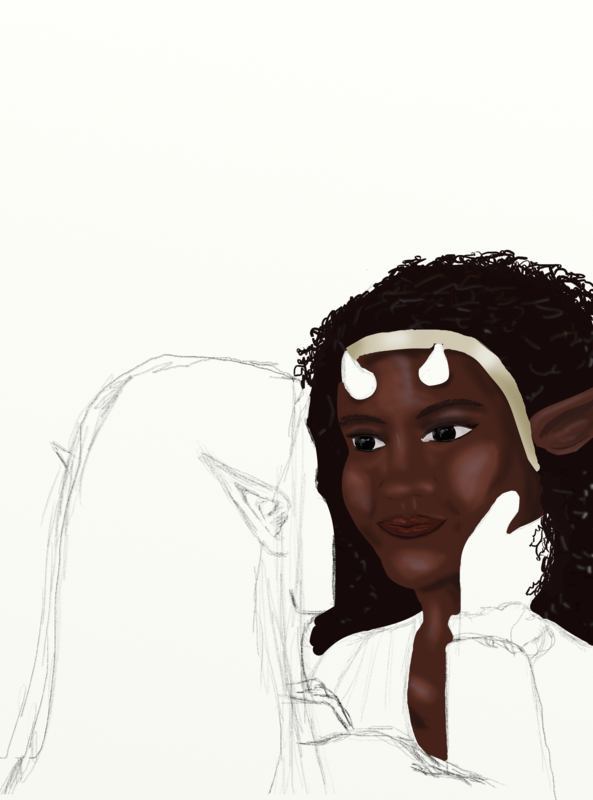 Possibly I could fix it without restarting entirely, but I think re-doing the underlying sketch and coloring anew will be less frustrating. Revised version-in-progress! Got to about the same place as the earlier one, after 2.5 hours, and am much happier with it. Not wild about how it looks at thumbnail size, though. 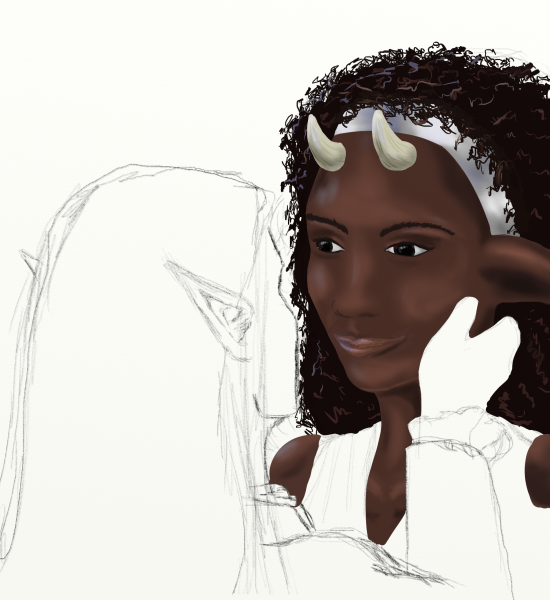 I may need to do the headband in a different color so it doesn't blend with the horns at mini-size. Or change the horn color. In the book I just finished drafting, The Moon Etherium, shapeshifting is trivial, and many people in the setting change their appearance casually, including changing their gender. Gender is mostly about aesthetics, but gender differences are considered a fun thing to play with. One of the major characters, Jino, likes to present variously as either male or female. Jino has a mild preference for male forms; let's say Jino has historically chosen to present as male about 75% of the time. When Jino is present in a scene, the narrator and characters interacting with Jino use the pronouns appropriate to Jino's current gender presentation. When Jino presents as a woman, everyone uses "she", and when Jino presents as a man, everyone uses "he". I'm reasonably happy with the way this part works. Jino is the parent to one of my main characters, and that character variously calls Jino either "Dad" or "Mom", as appropriate. I'm a little squidgier on this one; I am concerned that it will confuse the reader, especially since the character's other parent, Ele, is also a significant character and consistently presents as female. (Ele is never called "Mom"; she's referred to as "mother" or by title). There are a number of conversations that take place where other characters are talking about Jino while Jino's not present, and the characters have not particularly consistent in what pronouns they use for Jino. I haven't come up with a good solution for this issue. Is the character who only met Jino once while Jino was presenting as female going to consistently use 'she'? Or 'he' because the son usually calls Jino "Dad"? I don't really want to use "they"; I've been using "they" for characters using nonbinary gender presentations, and Jino presents unambiguously as either male or female. Moreover, it wouldn't get me out of "should the son call Jino "Dad" when Jino isn't around, even if Jino was female the last time the son saw Jino?" issue. I don't think there's a good gender-neutral parental nickname? If someone knows of one, please let me know! Anyway, looking for thoughts on the topic, particularly from folks who identify as genderqueer themselves. Thanks! Edit: Members of this society learned relatively recently how to shapeshift. Their language still has words for gender and still has pronouns for gender, and people still use these. Because seriously, reinventing a language that has gender-based pronouns to not use them is painful. You think getting English speakers to accept a non-gendered third person pronoun is bad? Try getting them to ditch "she" and "he" entirely. Distinguishing pronoun antecedents becomes twice as hard. Yes, it's a stupid arbitrary way to categorize people, but from a language standpoint, arbitrary categories are better than no categories. Also, my book is written in English, so I am going to use English pronouns, regardless of what the characters in the story are used to. April is "Camp Nanowrimo", a choose-your-own-goal version of Nanowrimo. I did not intend to do Camp Nano. I didn't set a writing goal for April. On April 1st, my goal for April was "do more research for Birthright". I did do a little of that, but not much. What I did instead was accidentally win Nanowrimo. Not even just win: CRUSH Nanowrimo. I started writing The Moon Etherium on April 5. By the end of April 30, the draft was up to 67,000 words. By the end of May 4 -- 30 days after I started -- it was 81,700. This is the fastest and most easily I've ever written anything. By a huge margin. My previous record for "most writing in one month" was Nanowrimo 2007, where I dragged myself to just over 50,000 words and disliked the process so much that I never finished the half-completed book. (It's about 80% done now, but has serious structural flaws.) My record for "most writing in 30 days when I was enjoying myself" was 40,000 words in 2006, when I was finishing Silver Scales. This April, the days when I wrote 1700 or 1800 words were the ones when I groused about how little I had written. ME. I was COMPLAINING about writing a MEASLY Nanowrimo target number. Even I thought this was kind of intolerable on my part. I slowed down last week: last Monday-Friday I averaged 2200 words per day, and when I woke up Saturday morning I didn't want to write. I wrote anyway, because it's what I do now, but "only" 1800 words or so. Then on Sunday, haikujaguar wrote ten thousand words, and I was spurred to write faster. I've written eighteen thousand words in the last five days. As of this writing Friday morning, the draft stands at 85,200 words. By coincidence, haikujaguar and I started our current WIPs at the same time. We did not start out competing, because my normal standard for a good clip is 500-1000 words per day, and her normal standard is 1500-2500 words per day. But I came out of the gate unusually fast for me on The Moon Etherium, and rocketed through the first weekend writing over 4,000 words per day. Micah said, "You're on fire!" and then progressed from fire emojis to a volcano emoji. "I should make my new goal 'stay ahead of Rowyn'," she joked. And "ahhhh the lava is going to catch me!" For ten or fifteen days, I was actually in the lead of our mock race. And if you'd asked me beforehand, "is it a good idea to compete with a friend on who can write faster?" I'd've said "NO NO STAHP WHY WOULD YOU DO THAT TO YOURSELF AND SOMEONE YOU LIKE?" But we had a competition that consisted entirely of silly jokes and cheering each other on. Any competitive impulse I had to say "no write slower Micah" was overwhelmed by the pleasure of watching her book grow and knowing I'd get to read it sooner the faster she wrote it. She took the lead last Sunday, and I was afraid I'd slow down after it became clear I wasn't going to catch her again. (In the 5 days that I wrote 18,000 words, Micah wrote 30,700). But I didn't slow. I've been writing 10-20% faster, actually. I make jokes on Twitter about riding my turtle in her wake, and I cheer her on, and I still like the race metaphor just as much now that I'm behind. It's just been fun. I started writing on April 5, but I started noodling with what became The Moon Etherium six days earlier, on March 30. I wrote several thousand words of notes, world-building, and the solidest outline I've ever made. I labored over the outline, because the book I wanted to write required some cleverness on the part of the characters, and I was afraid I couldn't make it work. When I had the last piece in place and I thought it would all hang together, I wondered if I'd still want to write it. "I already know how the story goes." Turns out, I do still want to write it. And having the outline there meant I was rarely unsure what I wanted to do next. A couple of times, I stopped to refine the outline further, either because I'd gone off the rails or because it didn't have enough detail for me to know what I was doing. On the whole, it's been great. I do not always want to write what's next, and I have made substitutions/additions/removals as I go along. But so far, I've never felt stuck. And now, after finishing 57 scenes, my estimated scene count? 78. Four scenes. I'm almost 75% done and my estimate has only gone up by four. Plot points that took more scenes than expected have been almost exactly cancelled out by ones that took fewer. My estimated length when I started was "80,000 to 120,000 words, but strongly leaning towards 120K". My estimate now? Still about120K. What. I have never accurately predicted length before. O.o Technically, I haven't yet, but I'm two scenes from the book's climax so. Pretty sure it's not going to run to 200K. I started noodling with a new book idea on March 30 because I'd spent March writing romance-oriented dragon bios in Flight Rising. After the last one, I decided, "If I'm this desperate to write romance, I should write origfic so I can get paid for it." The Moon Etherium has a lot more non-romance plot than I had originally intended. It was supposed to be the B-plot to keep my protagonists together while they fell in love, and now it's more like the A-plot while the romance is a strong B-plot. But there's still a lot of romance, and I made a point of scattering the kinds of scenes I like to write throughout the outline. So there were always fun scenes to look forward to, even if the current scene was tricky or hard to write. And I just really like to write people falling in love. This may be bad news for all my story ideas that do not have people falling in love. Oops. I don't know if this made a difference or not, but I'm going to note it here anyway. I haven't had any cheerleaders reading along as I wrote. Usually i serialize my novels-in-progress to a small group of close friends. But I haven't felt a need for outside encouragement, so I haven't looked for it this time. I showed the outline to two people and the first scene to one, and that's it. 85,000 words that no one's seen but me. I haven't even re-read most of it yet myself. WEIRD. On the other hand, I didn't show most of Further Arrangements to anyone while it was in progress, either, so I don't think this actually gets me to write at several times my usual speed. I suspect "I want to write quickly" correlates with "I don't need encouragement", but the cause is internal motivation, not that external motivation is particularly detrimental to my writing speed. This weekend will probably be a slow one for me, writing-wise. I am renting a car so I can run errands, I have to mow the lawn (SO BADLY), and I'm feeling a bit burned out. I mean, I wrote a page already today. I'm not STOPPING. But I may not make it to 3000 words today. That's OK. I do expect to finish the book in May. I'd like to finish it before my trip to Seattle on May 18. We'll see. I'm sure it'll be fine. PS: 85,000 words in 31 days! WHOA.